14 Days is a 2-player tabletop game about life with chronic pain. Folks who enjoy tabletop games! We designed 14 Days with a focus on migraines because the subject matter is personal, and it’s one we can present with confidence. The mechanics of the game are based on the unpredictability of migraines and the medications, rebound headaches, and misconceptions. However, there are many types of chronic pain that impact and reshape people’s lives. We hope 14 days can serve as a resource for building empathy and understanding. 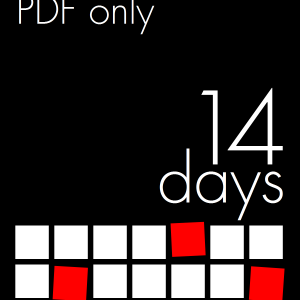 14 Days isn’t a game about describing pain. It’s a game about balancing the responsibilities of everyday life when you don’t know what tomorrow will bring. Looking for spare calendars? Download and print one here.